Covering nearly a million miles a day, NASA's nuclear-powered Voyager 1 spacecraft, 36 years and 12 billion miles from Earth, has crossed the boundary between the sun's influence and interstellar space, sailing into the vast gulf between the stars to become humanity's first true starship, scientists announced Thursday. "In leaving the (solar system) and setting sail on the cosmic seas between the stars, Voyager has joined the other historic journeys of exploration such as the first circumnavigation of the Earth and the first footprint on the moon," said Voyager project scientist Ed Stone. "This historic step is even more exciting because it marks the beginning of a new era of exploration for Voyager, the exploration of the space between the stars." The sun, its planets, moons, asteroids and comets are embedded in a vast, somewhat teardrop-shaped region, or bubble, in space known as the heliosphere. The heliosphere is defined by the sun's magnetic field and is filled with electrically charged particles blasted away from the sun in all directions -- the solar wind. Voyager 1 reached the boundary of the heliosphere in 2004, a milestone marked by readings showing the speed of the solar wind had dropped below that of sound. But it took another nine years to complete the crossing and move out into interstellar space. The transition actually occurred in August 2012, but an instrument that would have confirmed that failed in 1980, forcing scientists to rely on less direct methods of observation. As it turned out, the sun cooperated, blasting huge clouds of charged particles and magnetic energy in Voyager 1's direction in March 2012. When the particles finally got there 13 months later, they created detectable vibrations in the electrically charged plasma surrounding the spacecraft. After studying those waves, scientists concluded the density of the material was 40 times higher than it would be if Voyager 1 was still in the heliosphere. Reviewing archived data, the science team saw similar, though fainter, vibrations in October and November of 2012. 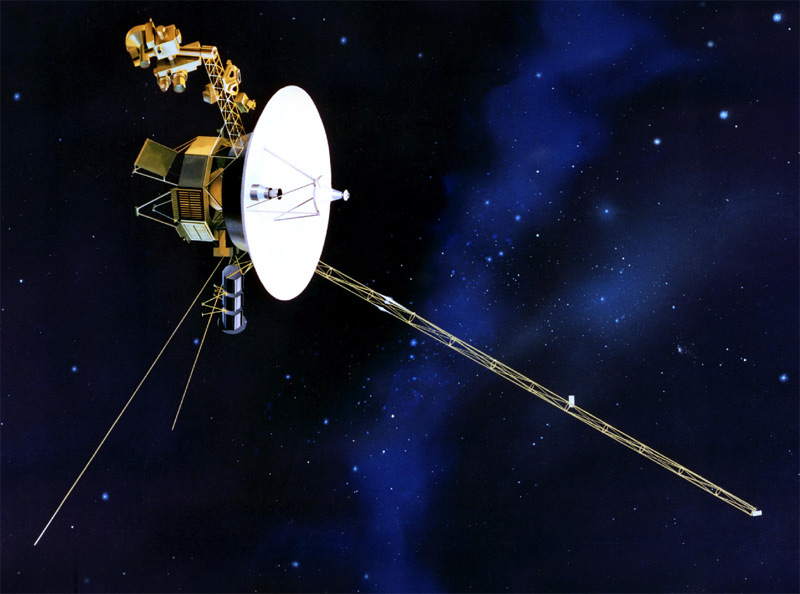 Comparing the events, the team concluded Voyager 1 moved into interstellar space in August 2012. "The atmosphere of the sun expands supersonically, a million miles per hour, creating a huge bubble around all the planets that's called the heliosphere," Stone said. "And inside that bubble, it's filled with the wind from the sun, which is (an electrically charged) plasma, and that plasma carries out from the sun the sun's magnetic field. And that fills this bubble. "Outside this bubble, the plasma comes from the explosions of other giant stars millions of years ago and that plasma carries with it the magnetic field of the galaxy. So that's what's inside. We are now outside." Don Gurnett, leader of Voyager 1's plasma wave experiment at the University of Iowa, announced the milestone in a paper published in Thursday's issue of the journal Science. "We literally jumped out of our seats when we saw these oscillations in our data -- they showed us the spacecraft was in an entirely new region, comparable to what was expected in interstellar space, and totally different than in the solar bubble," Gurnett said in a NASA statement. "Clearly we had passed through the heliopause, which is the long-hypothesized boundary between the solar plasma and the interstellar plasma." Gary Zank, director of the Center for Space Plasma and Aeronomic Research at the University of Alabama-Huntsville, said there was no other explanation for the denser, cooler plasma that Voyager 1 is flying through and "I think we're obliged to conclude we are, in fact, in the interstellar medium." "This is truly a remarkable achievement," he said. "It's very hard for us to comprehend the space age started 55 years ago and in that period we've actually exited the solar system, we've exited the material that's created by the sun and we're in a truly alien environment. "The material in which Voyager finds itself was not created by the sun, it's created, in fact, by our neighboring stars, supernova remnants and so forth. So Voyager in some very real sense is material that's not from the medium in which it finds itself. So we've truly crossed over." Voyager 2 was launched on Aug. 20, 1977, followed 16 days later by Voyager 1 on Sept. 5, 1977. Voyager 1 passed Voyager 2 on the way to Jupiter and flew past the giant planet on March 5, 1979, using its gravity to change course for a Nov. 12, 1980, flyby of Saturn. After beaming back spectacular views of the ringed planet and its enigmatic moon, Titan, the spacecraft headed out of the solar system on a trajectory carrying it above the plane of the planets. Voyager 2 flew past Jupiter on July 9, 1979, and then past Saturn on Aug. 25, 1981. Using the gravity of the ringed planet to properly shape its trajectory, the spacecraft then continued on to Uranus for a Jan. 24, 1986, flyby and then Neptune and one of its moons, Triton, on Aug. 25, 1989. Neptune's gravity bent Voyager 2's trajectory steeply downward, out of the plane of the solar system's planets. Two other spacecraft -- NASA's Pioneer 10 and 11, launched in 1972 and 1973 respectively -- also are departing the solar system. But Pioneer 11 went off the air in 1995 and Pioneer 10 fell silent in 2003 when their nuclear generators could no longer provide enough power. The Voyagers have been beaming back a steady stream of data ever since their planetary flybys, measuring the fields and particles present in the far reaches of the solar system. Now, Voyager 1 and, eventually, Voyager 2 will study interstellar space to learn more about the structure and evolution of the Milky Way. "In a sense, this is only the beginning," Zank said. "Voyager has a rather remarkable capacity to surprise at every turn. We're now going into a completely new environment, it's truly alien, it's not part of the solar system. We've stepped into the galaxy, we're out of our solar environment and what Voyager is going to discover truly beggars the imagination." Voyager 1 is about 11.6 billion miles from Earth and Voyager 2 is roughly 9.5 billion miles out. At those distances, it takes more than 17 hours for 22-watt radio signals, moving at 186,000 miles per second, to cross the vast distance between the spacecraft and the giant antennas on Earth that are needed to collect the data. The radioisotope thermoelectric generators that provide electricity for Voyager 1 and 2 are slowly losing power -- about 4 watts per year -- but they are expected to keep both spacecraft alive through 2020. After that, engineers will begin shutting down science instruments one at a time until the spacecraft eventually falls silent. But their journeys will not end. On its current trajectory, Voyager 1 will pass within about 1.6 lightyears of a star in the constellation Camelopardalis in about 40,000 years. It will take Voyager 2 some 296,000 years to reach a point 4.3 light years from Sirius, the brightest star in Earth's sky. "What does it mean to reach interstellar space?" Stone asked. "Well, first of all, we got there! This is something we all hoped, when we started this 40 years ago, that this would happen. But none of us knew how big this bubble was, and none of us knew anything could last as long as the two Voyager spacecraft. "Certainly luck is an important part of this but wow, when we first saw that data a year ago it was really quite stunning after having been on the way for so many years."